A center table or coffee table is usually something you can use to magnify the effect of your décor. If you want to make your living room look more stylish then pay attention to your coffee table as that is the place where most family members, friends and pals gather around. Among this furniture option, Japanese tables are a favorite as the style is unique and different than traditional coffee tables in the West. Japanese coffee tables are low rise tables that do not have chairs with them. Instead seating is arranged around the table on a rug, mat, or even floor cushions. 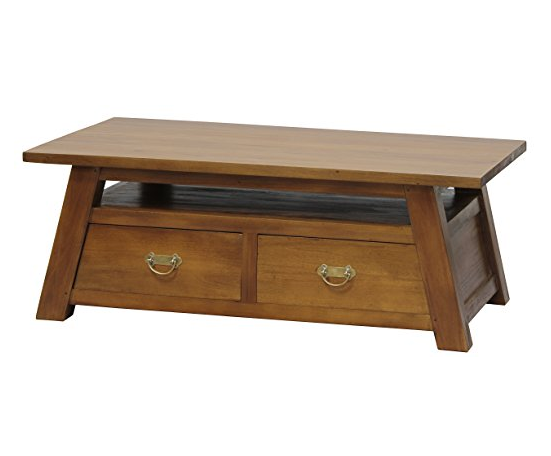 The Tatami Japanese coffee table is made from bamboo with a neat top and is durable. Coated with a protective finish this table retains its natural look and feel adding warmth to the room’s décor. The table features a clever storage design for putting coffee and tea cups, mugs and even a kettle along with snacks under the removable table top. This table will also come in handy for your outdoor and picnic activities. It has a sturdy and firm structure so it will not wobble when it is in use. The Tatami Japanese coffee table is not only useful but it is also a natural shade which will look good in multiple decors. This table can give both a contemporary and modern look to any room. It is very compact in size and can easily fit into the smallest of spaces. The design also supports weight on the table while simultaneously ensuring its light weight. As an added perk, the table comes with four sponge cushions for a comfortable seating arrangement. 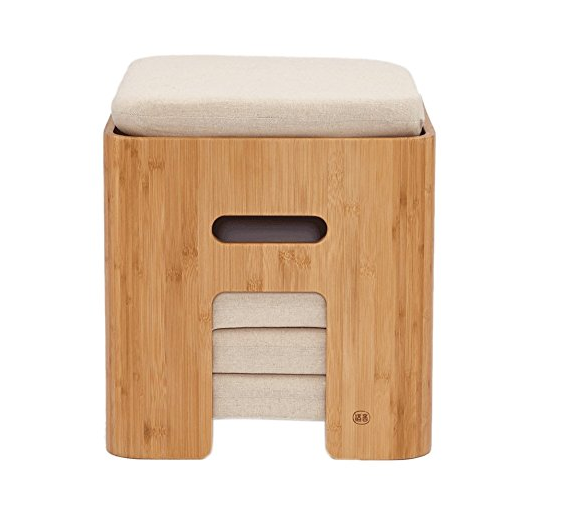 It is made from ecofriendly bamboo. It has a lightweight structure. It is a costly product. 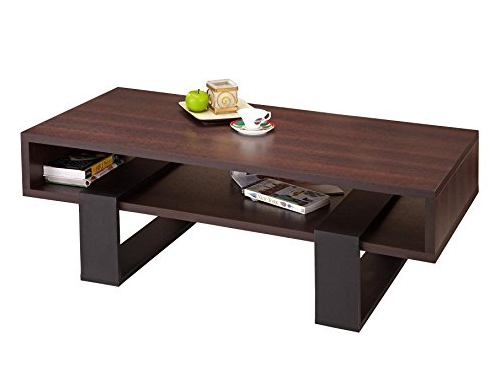 This is a stylish Japanese coffee table which has a walnut table top with a black finish. The black finish is also laminated which makes it look shiny and polished. The structure of the table is ultra-modern whereas the size is compact enough to make any room look spacious. It is also lightweight so you can move it around without much trouble. The interlocking legs featured on the design do not only add to the style of this coffee table but also make it strategically stable. This table is easy to clean and maintain so you do not have to worry at all. However, this table requires assembling when it arrives which may be the only setback of this item. The firm table top is perfect to place your accessories while you are working.It also has an open display area where you can place magazines and books. This coffee table will not only look good inside the home but also in formal office areas. Overall, this is a sturdy and sleek looking table that will go along with any type of décor. The combination of walnut and black is evergreen so it will not go out of fashion either. It is, however, an expensive Japanese style coffee table. It has a walnut table top with black legs. It has a laminated finish. 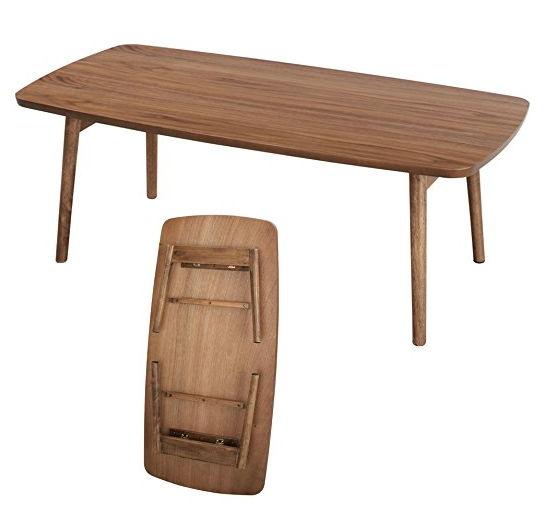 The Azumaya Japanese Coffee Table is made from natural walnut and rubber wood material. This coffee table also comes with removable under rack shelf where you can place your books, decorations, magazines, and laptops. Otherwise you can remove the shelf to make it look more spacious. The folding legs will easily let you store it in compact places or reduce it in small size while you want to clean around. This table has a horizontal top with a single layer wave which makes it look quite sleek as well. 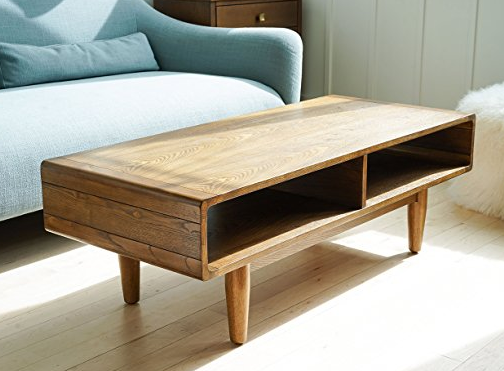 The Azumaya Japanese coffee table has a beautiful and sturdy built for day-to-day use. Despite its slim legs it will neither wobble nor wear out with time. This is another coffee table that will look good in multiple decors. It suits household and office interiors so that anyone can use this. This table is quite expensive but since it comes with a removable shelf as well, it is worth the price. This table will also arrive assembled to keep customers from any trouble. The Azumaya Japanese coffee table is easy to maintain and the polish will also retain its look for a long time. It is made from natural walnut and rubber wood material. It has a removable shelf. This Japanese coffee table is made from pinewood whereas the legs are made from metal. The table comes with a display shelf at bottom as well where you can place decorations, magazines and much more. There is a lot of distance between the two planks so that you will have enough space to place your items within arm’s length. This table has an ultra-contemporary color and style so that it will look attractive in your living room, office, bedroom or any other setting. This table features a sturdy structure which is wobble-free yet the size is compact enough to make the room look spacious. This minimal coffee table is also easy to clean. The only thing that might set you back is the fact that it requires assembling when it arrives, however it is simple enough to build. The Zinus Japanese coffee table is a unique combination of wood and metal which complement each other nicely in this design. It is an expensive coffee table but the structure, quality and design are worth the price. Since it is also dual-shelf you will get more space to place your assortments on this table without losing them. You can keep the top shelf neat for coffee and tea cups whereas place magazines on the lower plank. It is made from pinewood and metal. It has a minimal design. It is an expensive coffee table. This is a beautiful Japanese coffee table made from mahogany wood. What makes this table unique is that it comes with four drawers which offer storage around the living room or bedroom. You can place things inside the drawers to make the room look neater and spacious. On the whole, this table has a contemporary design with a touch of traditional details which makes it an everlasting investment in your interior decoration. The table is also handmade so every piece is different from the other which makes this even more special. Besides the multi-generational look of this table it also has a firm top with a sturdy structure which will retain its durability. Since it is a handmade coffee table you will need to maintain it with wax and oil overtime. If properly looked after, it will not lose its charm and quality. This is a very expensive Japanese coffee table but if you want to invest in an authentic interior piece then this is the right choice for you. This will be a very special piece in your household because no one else will have the same as yours. It is made from mahogany wood. It is handmade by local artisans. It is a multi-generation authentic coffee table. It is quite an expensive table. It requires maintenance over time. This is another unique Japanese Coffee Table that is handmade by artisans in China. This table is classical design that originated from Han Dynasty. Not only is the table handmade but it is also detailed which makes it even more special. At the same time, despite the traditional affiliation the table does feature a contemporary look with black ebony finish. The finish is also hand applied to make this table special for each customer who buys it. This square Ming table is perfect for various settings such as the house, office, sitting rooms, parlors and much more. From design to color, everything is authentic and individual. This elegant piece of furniture comes in black so that it will suit different interiors without a problem. 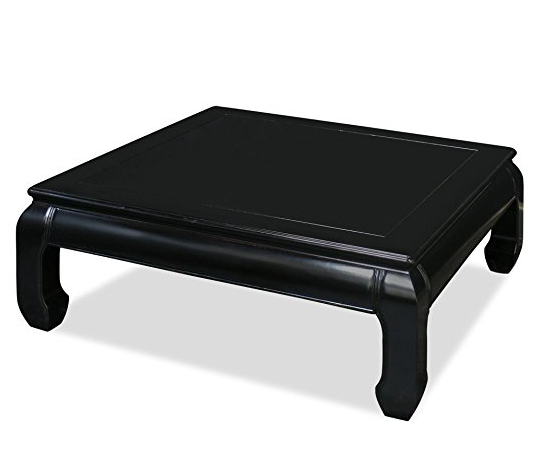 The ChinaFurnitureOnline Japanese coffee table does not require any assembling. Even though this coffee table only has one shelf, it is still broad enough to keep your decorations and assortments without making it look congested. The table can also be used to work while sitting on the floor as it has a firm table top that is even and neat. It is also an expensive table but since it is handmade and hand-polished you will not regret splurging over this unique piece. It does not require heavy maintenance either. It is handmade and hand polished by Chinese artisans. The neutral color will suit many interiors. It has very beautiful details. It does not require assembling. It is a very expensive coffee table. The Hives and Honey Japanese coffee table is made from solid wood whereas it has walnut finishing. This table is minimal and simplistic yet it is quite stylish and modern too. It is a 48 x 11 inch table which provides enough space to hold decorations, cups and other assortments as well. When you have a large gathering you will not have to look for more space to place dishes and other items in the room. This table is also made from finest quality of wood and construction to ensure its durability for a long time. It will retain its new look for a long period of time as well. Although this Hives and Honey table features a modern look the inspiration comes from mid-century furniture to add a touch of tradition in design. Another great thing about this coffee table is that it offers open-storage where you can slide in magazines, books and laptops whenever you need to clear up more space. It is also easy to clean so you don’t have to fuss about maintenance at all. 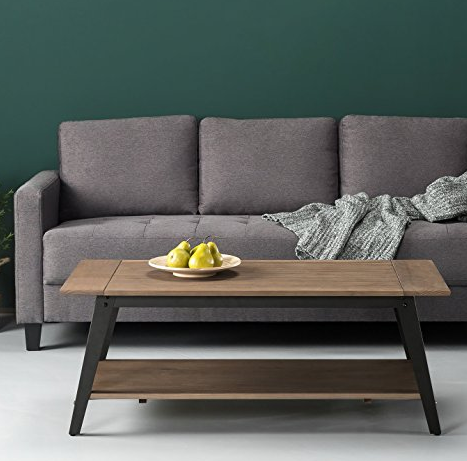 This coffee table is expensive but it is a thoughtful designer’s piece made from finest quality of wood with open storage so you will not regret buying it. It is made from solid wood. It is inspired by mid-century furnishing. This is a very unique coffee table that truly features the Asian accent. It is inspired by 18th century Chinese craftsmanship while maintaining a futuristic look. It is also made from artisans in Guangdong who put equal love and effort in each piece. Since it is a handmade table each piece is different from the other which makes it special for you. The best thing about this coffee table is the fact that table top is hand-painted as well. It features a garden scenery with gold leaf background which makes this table look beautiful. It also has a lacquer ending so that it retains its look for a long time. This table has been loved by customers who bought it because it does not only fit in the décor but also makes it look fabulous and luxurious. If you want to buy something that is culturally rich with fine quality then this could be the right choice for you. 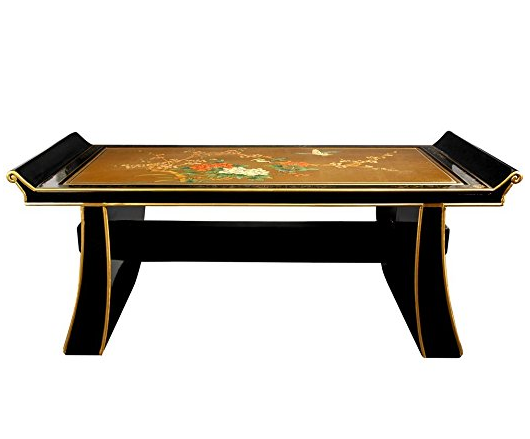 The Oriental Furniture Japanese coffee table is an expensive table but since it is handmade with hand-painting, it is worth its price. Besides that it also has a tray-design top with sturdy structure and safe finishing. This table could be one of the most beloved items in your house. It is hand-made table with hand-painting on top. It has gold leaf birds and flowers scenery. It is inspired by 18th century Asia. It is safe to say that there are so many Japanese coffee tables that it is hard to pick one. However, if you mean to buy something that will last you for years then you should opt for high-end tables that are handmade as they are more authentic and unique. However, if you want something more contemporary than traditional then you can choose minimalistic and simple designs that will also complement many settings. Whether you want to buy for an apartment, a house or office you should choose an interior piece that has storage that suits your everyday needs as well.